This shot was taken on August 13, 2013 at 7:55 AM. The "Take It!" came from my habit of looking down when I walk. It had rained for a brief time earlier and the water was beginning to evaporate from the pavers I was stepping on as I made my way into the building. The shape of a head of a dog appeared on one of the blocks and I quickly snapped a shot of it. 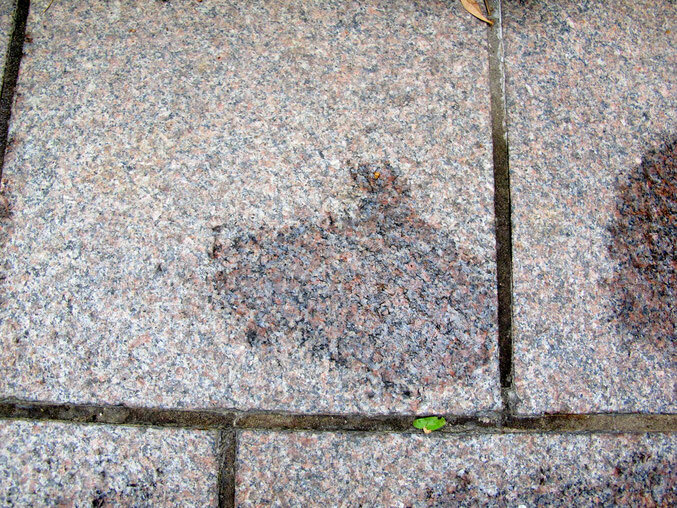 When I came back out of the building, most of the wetness was gone and the shape along with it. The After Take: To those I showed this picture to - all could see the likeness to a dog. I spoke with everyone about how sometimes shapes appear in the most unlikely places. We all agreed that the game of seeing shapes in clouds is a game most of us never get tired of - no matter how old we get. I think we may have a yet another reason to "watch our step." Wishing everyone, safe and sure footsteps, especially after the rain. I can see the profile of a dog head. I can see a thumbs up as well. Good catch, great imagination as always. Definitely see a dog in there.